Gift Guide: Holiday Party Hosts - Under $30 - Baby Doodah! It’s Holiday Gift Guide time! It’s the most wonderful time of the year again! A time when the halls are decked and everyone is celebrating. The warmth of spending time with family and friends is everywhere! Which can only mean one thing… Holiday Parties! Did you know that when you attend those parties, you should be bringing a Host or Hostess gift? It doesn’t need to be anything extravagant, but something to let them know you are thankful for the invite and for them hosting. However shopping for or coming up with ideas for a host can be difficult. That’s why I am here! 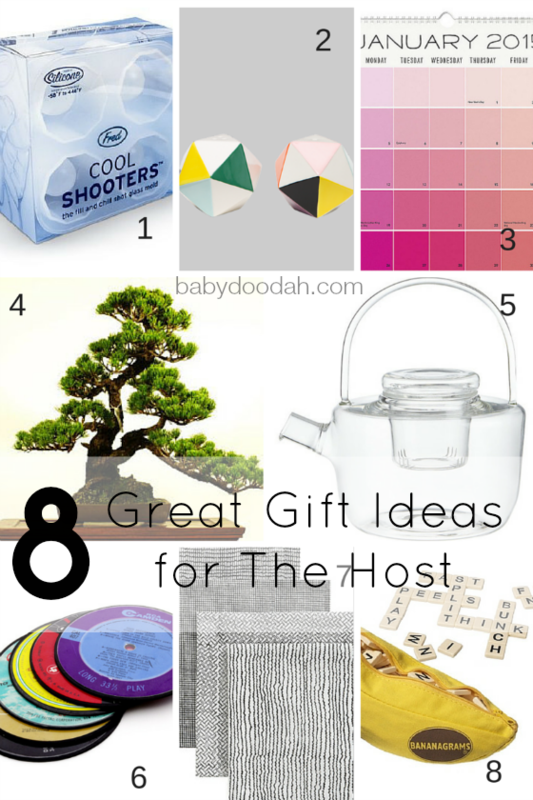 I have a list of 8 great gifts that will please just about any host. Fred Cool Shooters – Shot Glass Mold – How awesome would it be to make your own shot glasses out of ice? This could be a lot of fun if you knew your host liked to try out different mixed shots, or even if they just enjoy doing shots. A totally unique gift, one that your host is unlikely to have. Technicolor Salt and Pepper Shakers – Everywhere you go, people are likely to already have salt and pepper shakers, but most people ALSO typically just buy the basics, nothing fancy or fun. Enter these babies!! They’re cute, colorful and would look fantastic on just about any counter top. 2015 Paper Source Academic Paint Chip Calendar – Everyone needs a calendar in their home, and lots of people wait until after the holidays to go out and get one. Why not fill that gap? Get them this fun and funky calendar! Every month is a different color, so it’s sure to match any home. Grow Your Own Bonsai Trees – Okay, this one may require your host to have a bit of a green thumb, but think about how much fun they would have growing and nurturing their own bonsai from scratch. Betty Glass Teapot – This is a beautiful teapot! It would be lovely for someone to receive this and have it sit on top of their stove. Obviously, you’d want to get this for the host who enjoys tea, but it’s an affordable option that looks like it costs WAY more than it does. Record Coasters – Yup! Record coasters, which are REALLY made out of vinyl. These would be perfect for the host that has an affinity for records or music, or even someone who just loves to have an eclectic collection of items in their home. Blockprint Charcoal Napkins – Any kind of cloth napkin would be a great gift for any host, but if you go with this set you’re sure to match the color scheme in your hosts house. Black, white and charcoal, match EVERYTHING! Bananagrams – If your host is a word lover, then this is THE perfect gift. It’s fun and easy to pull out whenever people are around. You’ll get the chance to see what funny words everyone comes up with. Every single one of these gifts is under $30. I wanted to create a list that had beautiful, fun and unique gifts but DIDN’T break the bank. Check them all out!! I’m sure you’ll be quite pleased. And don’t forget! It’s already December 2nd, don’t wait to start making your shopping list and buying your gifts. Do it now before it’s too late and you’re left scrambling to pull something together at the last minute. Shopping is so much MORE fun, when you take the time to savor and not rush! If you’re looking for some ideas on how to fill your toddler’s stocking this year, check out my post with some great toddler stocking stuffer ideas. What gifts have you given to hosts, or received as a host, in the past? Some of the links in this post are affiliate links, this does not change the cost for you, I simply receive a portion of the sale. Thank you for helping to support my family! I am right on board with you! I always get my mom a calendar for Christmas. It’s an easy and useful gift!! Thanks for visiting! Oh man!! I LOVE Shutterfly!! I actually have it on my to-do list for this week, to make our yearly calendar and New Year’s cards. Can’t wait! !